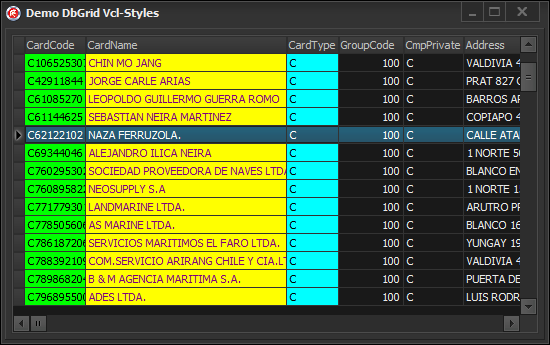 The TDBGrid component allows you to customize the colors of the columns and fonts used to draw the data. 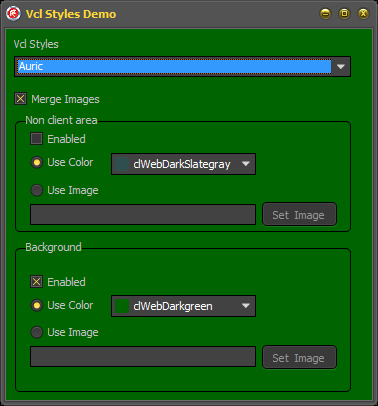 This issue is caused because the TCustomDBGrid.DrawCell method ignores the custom colors of the columns when the vcl styles are enabled. So the solution is patch this method to allow use the proper colors. After of this you will get a result like so. 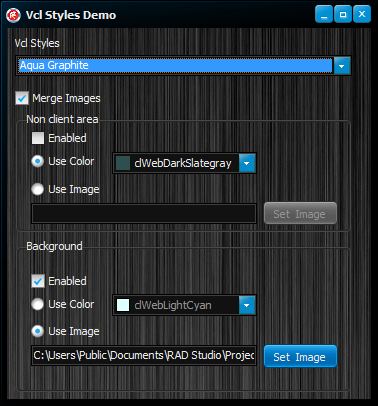 I just uploaded this patch as part of the vcl styles utils project. 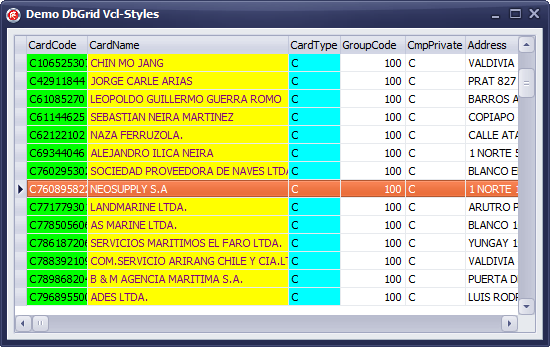 To use it you must add the Vcl.Styles.DbGrid unit to the uses part of your form after of the Vcl.DBGrids unit. 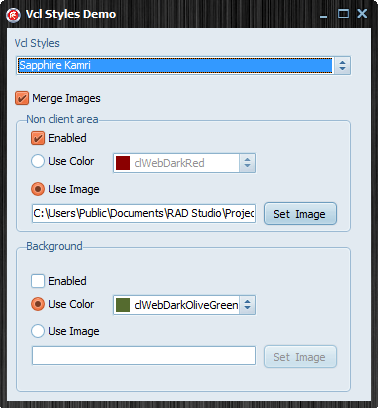 Categories: Delphi, Delphi XE2, VCL Styles | Tags: Delphi, Delphi XE2, Vcl Styles | Permalink. 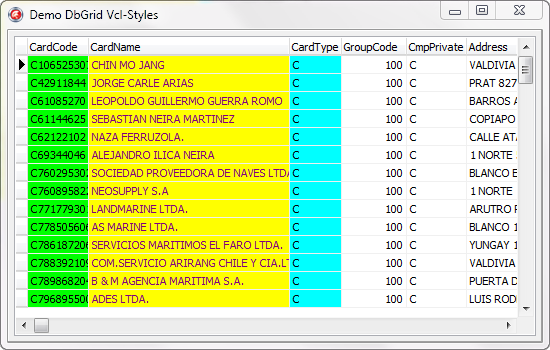 I just uploaded a new unit to the vcl style utils project called Vcl.Styles.Fixes, this unit contains the TButtonStyleHook style hook which fix these QC #103708, #107764 reports for Delphi XE2. A quick guide to evaluate and compile expressions using the LiveBindings expression evaluator. 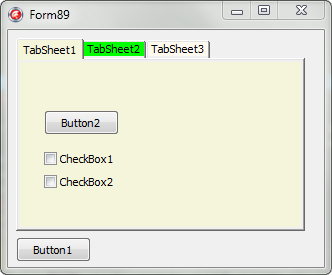 The LiveBindings technology introduced in Delphi XE2, includes a set of interfaces, classes and methods to evaluate and compile expressions. Today I will show you how you can use these classes to build, compile and evaluate simple (and complex) expressions. You can use these expressions for example to define formulas to calculate taxes, generate hashes, encrypt data or use in any situation where you need calculate a value where the values or factors may change (anyway the possibilities are endless), Also you can store these expressions in a XML file or a database and use them as needed. Note: In this article is not used the TBindingExpression class directly, instead are used the raw classes and methods of the of livebindings expression evaluator, because you can gain much more flexibility to build your expressions. Before to begin is necessary know the basic elements to build, compile and evaluate an expression. The IScope is the base Interface to hold the objects used to make the evaluation and compilation, here you store the methods , classes and values which will be used to build the expression. The Compile method located in the System.Bindings.Evaluator unit, is used to compile the expression using a IScope interface, this method will return a ICompiledBinding interface which can be used to evaluate and get the result of the compilation. The ICompiledBinding interface allows the evaluation of the compiled expression. The TNestedScope class allows you to merge IScopes. The more basic expression which you can use is based in the BasicOperators Scope (located in the System.Bindings.EvalSys unit), this allows you evaluate only numbers and the basic arithmetic operations, check this sample. Now if you need evaluate the value of a constant you must create a IScope descendent and add the constants to register, finally you must merge the new scope with the original using the TNestedScope. Tip 1 : The constants and identifiers in the expression are case-sensitive. The livebindings expression evaluator include a set of basic methods (ToStr, ToVariant, ToNotifyEvent, Round, Format, UpperCase, LowerCase, FormatDateTime, StrToDateTime, Math_Min, Math_Max) which can be used in our expressions, these are defined in the System.Bindings.Methods unit and must be accessed the TBindingMethodsFactory class. Check this sample code which uses the Format function. Tip 2 : The strings in the expressions can be surrounded in double or single quotes. Most of the times when you build an expression, you will need register a custom method, this can be easily done using the TBindingMethodsFactory class. The first step is create a function wich returns a IInvokable interface. For this you can use the MakeInvokable method and then you write the implementation of your function as an anonymous method. Finally using the TBindingMethodsFactory.RegisterMethod function you can register the custom method. Tip 3 : Remember use TBindingMethodsFactory.UnRegisterMethod function to unregister your custom method. In order to use your own class in an expression you must create a Scope using the TObjectWrapper class or the WrapObject method. 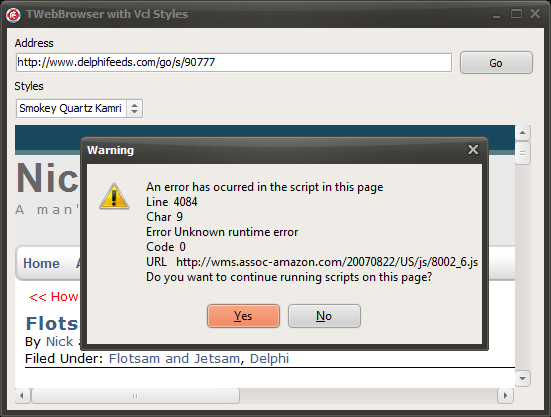 Categories: Delphi, Delphi XE2 | Tags: Delphi, Delphi XE2 | Permalink. Until now if you want change the color of a TTabSheet in a VCL application you must create a new descendant class of the TTabSheet component, then handle the WM_ERASEBKGND message, set the TPageControl to OwnerDraw property to true and finally implement the OnDrawTab event. And after that you will have an awfull and un-themed TPageControl. In this post I will show you how using the vcl styles you can gain full control over to paint methods with very nice results. 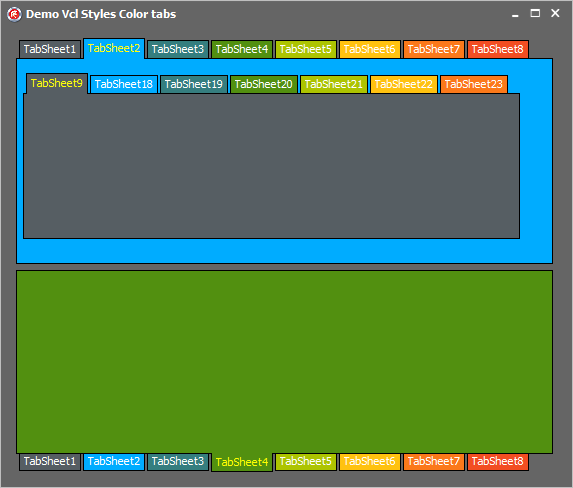 The PageControl.UpdateTab2 is part of a helper class to execute the private method TPageControl.UpdateTab and is just a trick used to inform to vcl style that need paint the active tabsheet. Now the second part is implement the style hook using the existing TTabControlStyleHook as base class, so in this way we only need override 3 methods (PaintBackground, Paint and DrawTab) and handle the WM_ERASEBKGND message again. Before we handle the WM_ERASEBKGND message of the TTabsheet, now we need do the same but for the style hook, because the style hook (TStyleHook) has their own messages handle routine. Following the implementation of the vcl style hook, this is the implementation of the PaintBackground method. Now the code for the Paint method, this procedure paint the body of the tabsheet and draw the child controls. LTextColor:=GetColorTextTab(LThemedTab);//this is a helper function which get the  text color of the tab based in his current state (normal, select, hot). To use this style hook you must include the Vcl.Styles.ColorTabs unit in your uses class after of the Vcl.ComCtrls unit and then register the hook in this way. 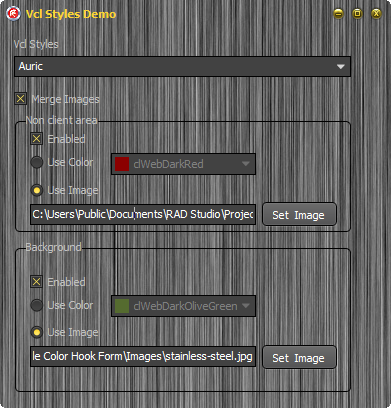 The full source code of this style hook is located in the vcl style utils repository. 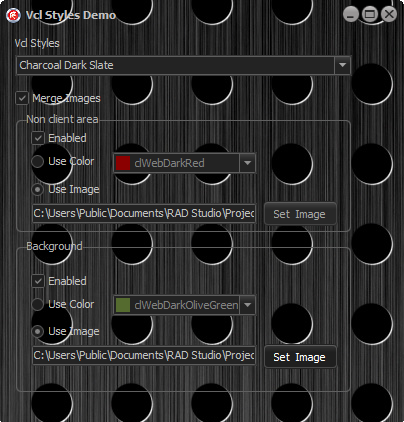 Since the introduction of the vcl styles, now you can use the style hooks to handle the paint operations of the TWinControl descendant, the main advantage about the styles hookz is which you can override the core paint methods directly, avoiding the flicker and in most cases you do not even need to handle the windows messages. So now I will how you how you can create a style hook to add a custom background image or color to a form including the non client area. The first step is create a new Style hook descendant of the TFormStyleHook class and override the PaintNC and PaintBackground methods. Note: the above class definition includes some additional elements to store the settings of the style hook like Bitmaps and Colors used. The PaintBackground method, paints the background of the form filling the control area with the current vcl style background color, in this case we are use a bitmap or a custom color depnding of the setting of the hook. //use a custom color for the background? To handle the paint operations over the non client area in the old versions of windows (before to windows vista) you must handle the WM_NCPAINT windows message or since Windows Vista using the DWM API you can accomplish this task. 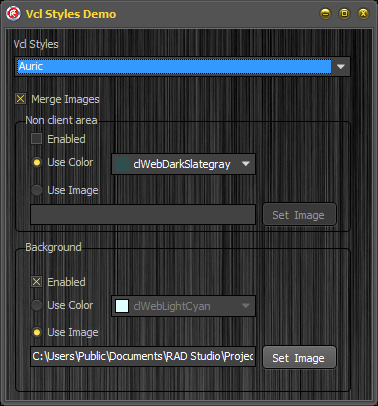 But if you uses the vcl styles only you must need override the PaintNC method. 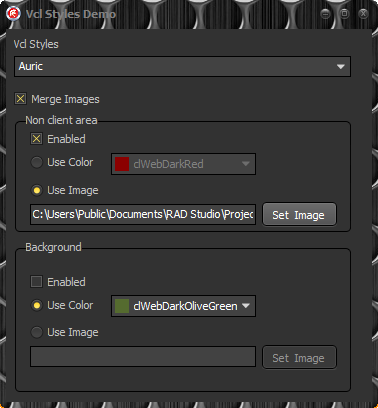 This is the implementation of the PaintNC method to use a custom color or image in the non client area. The full source code of the TFormStyleHookBackround class is available here and is part of the vcl style utils project. 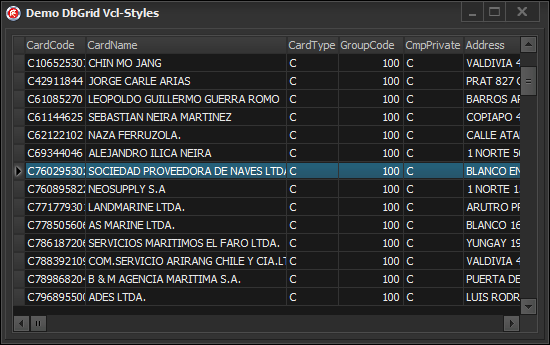 to use it just include a reference to the Vcl.Styles.FormStyleHooks unit in your project and register the style hook like so. Download the demo application (binaries) from here. 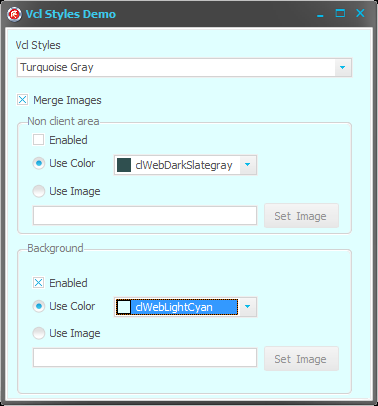 Delphi VCL Styles and TWebBrowser, source code released. First I want to thank you, for the great feedback of my last post, all your comments and issue reports were very useful. While I was working on my favorite personal project And I realized which the TWebBrowser embedded in one of my forms doesn’t look very nice when the VCL Styles are enabled. So I decide write a fix. 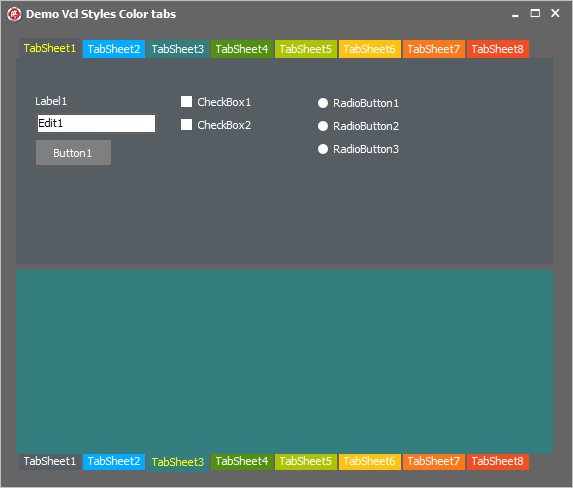 My main goal was skin the scrollbars of the TWebBrowser component which by default uses the native windows look and feel. This task involve many challenges like determine which WebBrowser events modify the position and visibility of the scrollbars, get the bounds of the original scrollbars, paint the skinned scrollbars, scroll the WebBrowser control, and so on. So I will try to explain briefly how was done. And also the WMSIZE message. In order to intercept these TWebbrowser events we can’t assign a event handler directly because these will not be fired if the same events are assigned by the user. So the solution was override the InvokeEvent method which is part of the TOleControl control (and which is the parent class of the TWebbrowser component). Also we need to call the same method when the WM_SIZE message arrives. After of that we need to paint the new Scrollbars using two TScrollBar components (Horizontal and Vertical), these controls are not draw directly over the Twebbrowser canvas rather, they are painted over a TWinControl which is a container for these controls, this container overlaps the original (native) scrollbars, also we need implement WMEraseBkgnd message to use the vcl styles color to fill the background of the container. This is the definition of the private TWinContainer class. As final step of this stage we need handle CM_VISIBLECHANGED message to hide or show the new scrollbars. 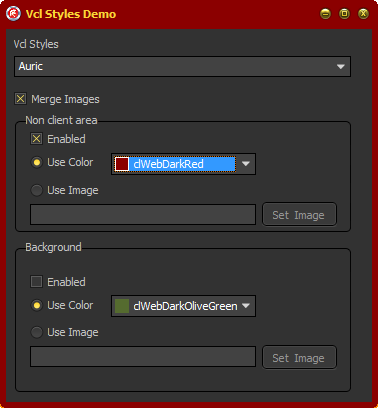 As you see in some of the above code a call to the ResizeScrollBars method is made, well this is one of the key points of the TVclStylesWebBrowser class, this method change the visibility , recalculate the sizes of the scrollbars and scroll the TWebBrowser. //the loaded page has body? Besides of the scrollbars we need to make small changes to the aspect of the TWebBrowser , for example remove the 3D border, this is made via the IDocHostUIHandler interface and the GetHostInfo function. Implementing the IDocHostShowUI.ShowMessage function you can replace the Windows Internet Explorer message box (which is used for Microsoft JScript alerts among other things). 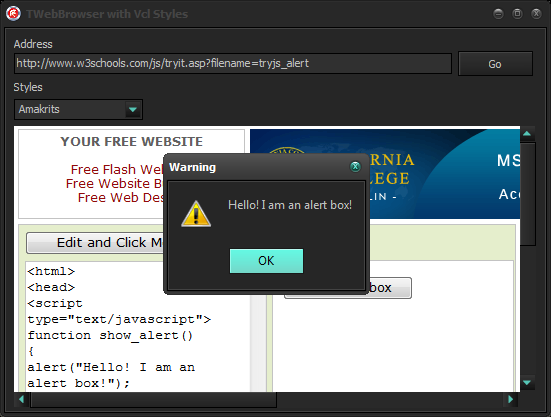 //use the vcl MessageDlg function to show an skinned message box. 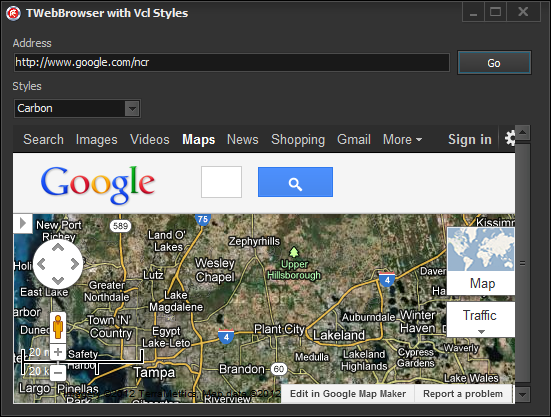 Note : In the end of this entry you can find a very useful collection of resources to customize a WebBrowser control. 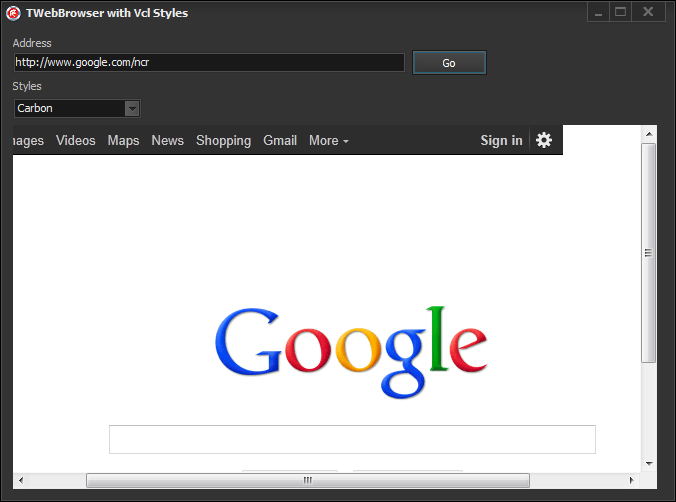 First the class introduced in this article is not a Vcl Style Hook, because exist some technical limitations to accomplish this, among them is the fact that the TWebBrowser control must implement additional interfaces (IDocHostUIHandler, IDocHostShowUI, IOleCommandTarget), so is necesary modify the original TWebBrowser component. This is part of an open source project, so feel free to post any issue in the issue page of the project, as well if you want participate improving the code or adding new features, let me now. 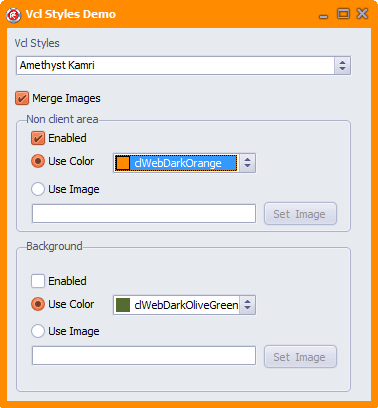 Categories: Delphi, Delphi XE2, TWebBrowser, VCL Styles | Tags: Delphi, Delphi XE2, TWebBrowser, Vcl Styles | Permalink.